Sanderling House is a fully-equipped holiday home which will comfortably sleep 8 people and is less than a minute's walk from the sea, pub and local shop. Situated in the beautiful village of Dale, Sanderling House is perfectly located for easy access to a wide range of holiday activities and adventures. 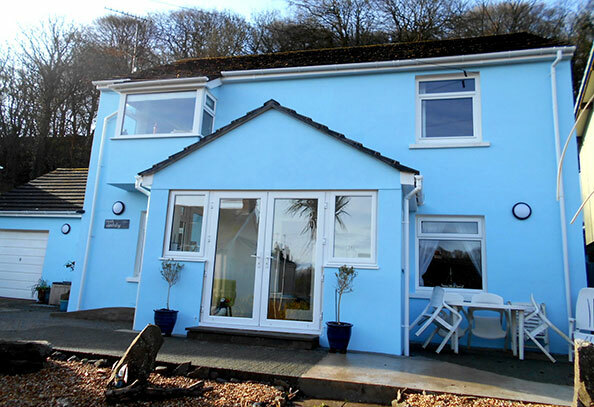 Holiday Cottage / Accommodation / Self Catering Holiday Let : 4 bedrooms, Sleeps 8, dog-friendly just 1 minute walk from Dale beach on the Pembrokeshire coastal path. Spacious detached house, holiiday cottage, accomodation, in a peaceful location just 1 minute from Dale beach with sea views, ample parking (for cars and a boat) and beautiful gardens. Sanderling House has won the TripAdvisor Certificate of Excellence, this award recognises businesses that consistently earn top ratings from TripAdvisor travellers. Please be aware of scams and fraudulent web sites, you can always ring me or contact me by letter as well as email. Only use this official web site. 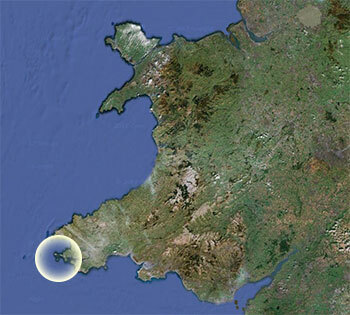 Dale peninsula is at the extreme south west tip of Pembrokeshire, which itself is the county at the far south west corner of Wales. The village lies in a sheltered valley with beaches at both its west and east facing ends. West Dale faces directly towards the wild Atlantic while Dale beach is sheltered and a mecca for watersports. 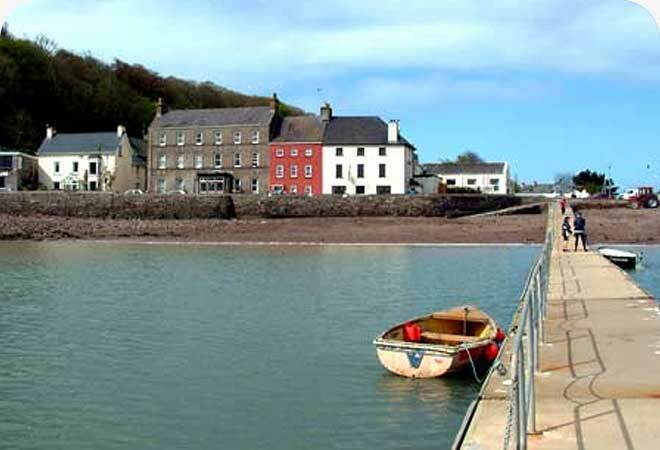 Dale is an unspoilt village in the heart of the Pembrokeshire Coast National Park. The traditional activities of agriculture and fishing still take place and have been joined by tourism as a major aspect of the area. The village is a popular location for family holidays – safe beaches and lots of water-based activities such as sailing, swimming, surfing, kayaking and windsurfing. The area has an abundance of wildlife including birds, seals, dolphins and porpoise. The cliffs and coastal path also provide stunning views and the chance to see a wide variety of beautiful wild flowers. 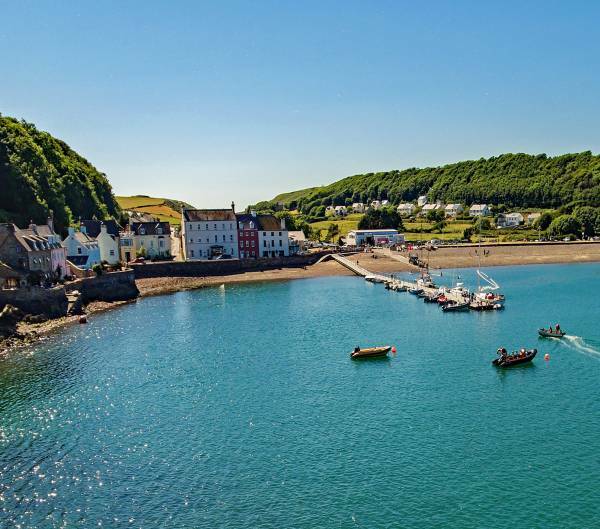 Its location on the long distance path of the Pembrokeshire Coast National Park make the village a centre for walkers and those wishing to explore the offshore islands and their flora and fauna. The award winning Griffin is run by our friends Simon & Sian .specializing in locally caught fish dishes as well as a full restaurant menu an experience not to miss. They complement thier food with excellent wines, they have an extension, with beautiful views of the bay. Run by Kath and Tony a fantastic cafe that seves snacks meals and icereams all day.We enjoy their infamous all day breakfast, their locally caught crab sandwich and of course Pembroke Promise ice-cream (a must admit these are my favourites) and here you can also buy basic provisions and all sorts of gifts a real Aladdin's cave. Founded in 1958, Dale Yacht Club has a long tradition in both dinghy and cruiser sailing. Situated at the western end of the Milford Haven waterway, it has the benefit of a large, sheltered bay which provides an excellent, safe dinghy sailing area.Dinghy racing takes place every Thursday and Sunday during the main season with the Sunday series continuing until late autumn. Junior sailing training sessions take place through the summer.Dale Yacht Club hosts a number of regattas during the year – both its own events and as host for other fleets. Non members welcome. Run by Shelly and Chris They have a bar with a pool table and restaurant offering great food, child and dog friendly. Our local sculptor Sean has amazing drift wood sculptures to sell. Check him out on face book. You can see his work if you walk past the yacht club up the hill and his work is displayed on the right. His wife Wendy is an artist and authoress and has recently written the famous Dollymops books which she has illustrated. Look on Amazon to buy a copy. She is very kind and will sign it for you, a fantastic gift for any child. Run by Philip and Helen who are so welcoming and it is so interesting watching them work in the actual shop making Sterling Silver jewellery incorporating semi-precious stones, beads, crystal, shell and other natural materials. Community-run with interesting displays and information of Dale village and surrounding areas -new and old - open most days entry free. Is run by our friend Andy Truelove who provides fishing trips and chartered boats which are available off the pontoon - all equipment is provided and all levels are catered for: from the novice to the experienced sea fisherman. They provide sea angling: shark fishing, diving and wildlife pleasure trips ... a great day out. Our friend Mark has fished the waters in Dale since he was a child and now runs a small family fishing boat business promoting sustainable fishing with a personal touch. He offers fresh fish, lobster and crab direct from our boat to your plate. They can meet you at Dale pontoon to buy from the boat or they can deliver to the house they only live down the road. They also have Lobster and crab available in there tanks at their home. Mark also does a fantastic seafood BBQ packs they provide the disposable BBQ. A lovely shingle beach with some sand at the far end at Black Rock. A busy pontoon with boats coming and going and children crabbing. The beach is dog-friendly but they can only be let off their lead on the Yacht Club side of the pontoon. It has been awarded European Blue Flag Status Beach. Sanderling House is in easy reach of dozens of beautiful beaches, West Dale being only 15minute walk from the house and of course the Pembrokeshire Coastal Path. Check out all the beaches on Sanderling website. Just around the corner from the house is the Griffin Inn reknowned for its fresh fish. Also within easy reach are The Moorings Restaurant and The Boat House Cafe. For further details of more places to eat look at Sanderling website. Dale is surrounded on 3 sides by the Pembrokeshire Coast Path so there's plenty of superb walks to be enjoyed along the paths around Dale.